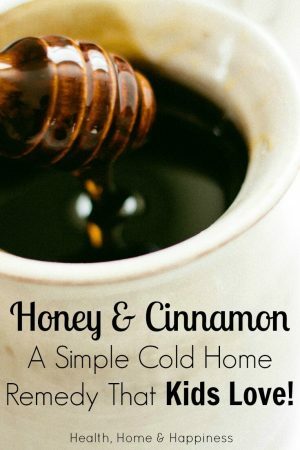 Home » natural health » Honey and Cinnamon~ A Simple Cold Home Remedy that Kids Love! Did you know that a teaspoon of honey (raw is best) and a 1/4 teaspoon of cinnamon will usually knock out a cold within a day or two? Take twice a day for 3 days for best results. My small grandson, age 3 loves this combo (I mix it in a small bowl and then feed it to him on a spoon, having a glass of water for him to drink down with it). We’ve used this for the past two years to knock out colds. It is best to take with first sniffles as it will usually take away all vestiges of the cold within 5 hours. This information is easily found on the web. We tried it and couldn’t believe how fast and well it worked. It has helped to keep us cold-free for more than 2 years. We’ve all used this remedy now a couple times and it has worked! I’ve used echinacea in the past, but with the honey-cinnamon remedy, I can really feel it working right away. 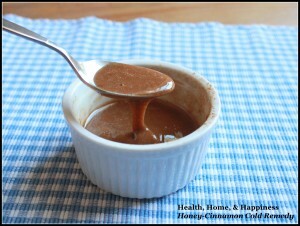 I usually stir my honey cinnamon mixture into tea, and the children use theirs as dip for fruit. I love having something that can work on that dreaded ‘I think I’m getting sick’ feeling. As with all home remedies, your mileage may vary and please do not substitute this for proper medical advice! Honey should not be given to infants under 1 year old due to the risk of botulism. Raw honey is most beneficial when found locally, but if that’s not an option you can buy it online here. Another Natural Remedy: I’ve found this Chinese Herbal Remedy to be the only thing that is natural that helps once a cold is under way. Garlic and Honey can also be a good cold remedy. Take this amount every few hours as soon as you feel a cold or other illness coming on. After initially trying it with only one 'dose' and seeing the immediate effects, I now mix up a small bowl full of honey and cinnamon and spoon it into hot drinks or dip fruit into it all day long. I find that with young children it's easy to just treat the whole family with this simple yummy remedy upon the first sign of a sniffle from anyone. 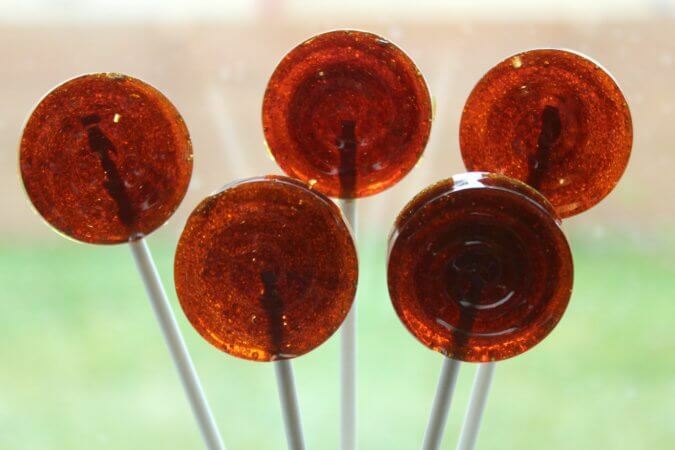 You can also make honey-cinnamon lollipops! Recipe here. 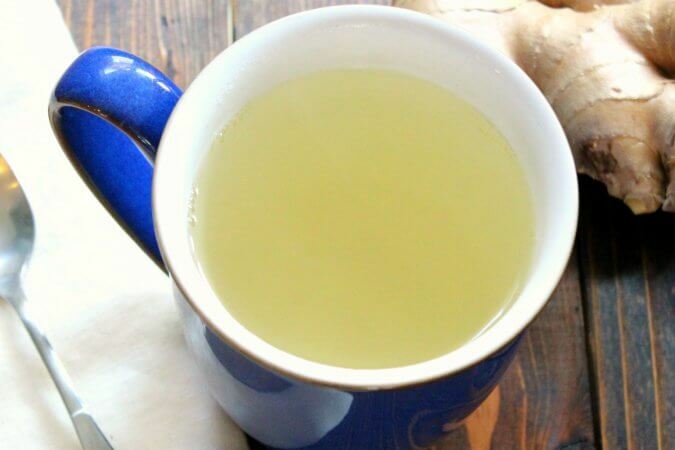 Ginger tea can also be soothing, especially for sore throats or stuffed sinuses. See how to make it here. Thank you. This is great timing, as my daughter is sick today and I am feeling a lot lost on what to do for her. This is the first time of my kids getting sick since I started reading and researching Nourishing Traditions, and GAPS, which was only 2 months ago. Cara, does it matter if it is Ceylon Cinnamon? I read that cinnamon at the local markets are not “real” cinnamon. I believe Ceylon Cinnamon is much better for you but I haven’t researched it. you have to use ceylon cinnamon as the usual one in supermarkets which is cassia is toxic especially for children if taken on a regular basis ceylon is perfectly safe even taken every day, you can buy it online. How could the Cinnamon sold in Grocery stores be TOXIC to children and still be sold? It has been a grocery item for many years.. and there is not a warning down the side saying not to ingest. Cheryl, it is not toxic with the cinnamon challenge, it obstructs breathing because when you try to shove a large amount of dry powder into your mouth, you can’t actually swallow it. Uhm gee, could it be because there are lots of things in the grocery store that are toxic. Ever heard of gmo’s? Wake up lady. even the cinnamon powder that we buy in local grocery stores is not made with ceylone cinnamon. if made with ceylone or one of the other acceptable types, it will say so on the product packaging. Ceylone comes from Sir Lanka they say. You can buy Ceylon cinnamon on Amazon. I purcahsed a 1 pound jar for around $28.00. It should last a long time. YIKES! That is expensive! http://www.mountainroseherbs.com has it for MUCH cheaper! $13.50 per pound for ceylon (sweet) cinnamon. cinnamon in stores is not toxic! As someone pointed out, raw cinnamon without being mixed in ANY form can kill you because of respiratory issues- see below- but I am 52 and have eaten LOTS of store- bought cinnamon all my life and I can assure you I am not dead or poisoned! People hype “organics”, “gmos” etc and that is all it is- hype and people trying to sell their products- there is zero proof it is any better for you and some organics are actually worse! I’m not sure what cinnamon I have but will I get botulism poisoning from the regular cinnamon sold in stores? Hey does anyone know if you could take this everyday just to avoid germs and keep healthy all year round? Absolutely you can! Cinnamon + Raw Honey has an impressive list of health benefits. Google for “cinnamon and raw honey benefits” to see all the articles about it. The key though, is using RAW honey. The clarified honey you see in the grocery store has had all the health benefits removed. It’s only good as a sweetener. Research that too! Very informative. i have had a horrible cough for a couple of weeks. it only gets bad at night, waking me at odd hours of the morning, and then not being able to go back to sleep. i mixed up some cinnamon and honey..and i actually slept for 8 hours last night!! I didn’t have any raw honey in the cupboard..so i used what i had.. this am, i can finally feel the crud breaking up. If the store bought honey worked after just 2 doses, well needless to say, i am headed to the health store today to finish knocking this crap out of me. thank u for the tip. Here it is 3 years after you made your reply and my daughter is sick today too. So, I’m going to try to buy some cinnamon & honey for her. I’m also giving her garlic toast. Garlic is called the “King of Colds” because it is a natural antibiotic. Luckily, she loves garlic toast! I heat the garlic in the microwave until it is tender. Then I chop it up and spread it on toast with butter…and she eats it. Simple stuff. Give it a try. Hey! I’m going to make some garlic-cinnamon-honey toast! I hate to be the Debbie Downer here but I started putting honey and cinnamon in my Yerba Mate when I first started sniffling but my cold has progressed anyway. I may not have taken enough, though. I’ll increase my dosage and see if that helps. I’ve also been taking high dosages of vitamin C and using Elderberry Extract. I’ve just started coughing this morning. Hopefully my efforts will at least lessen the duration of this crud. No worries! I love to hear other’s experiences, even if it didn’t work. I try to take the honey/cinnamon mixture three times a day, and it really seems to work best before the cold has progressed at all. Sorry so late but it may have not worked because you put it in your hot Yurba Mate. The heat will kill the live enzymes of the raw honey fairly quickly. If you like honey with you tea put it in your mouth first and drink the tea after. This keeps it alive and healing! Definitely going to try this one! Is it safe to give under 2 year olds honey? I thought that it wasn’t. I believe that it’s only the children under 12 months that you’re not supposed to give honey to. I wonder if for the little ones, something with coconut oil and cinnamon would be effective, and just a dab? Coconut oil is also antimicrobial. Some say 1 year some say 2, so I just play it safe and go with 2. Only children under 1year, after that it’s supposed to be ok. Little Remedies makes a natural honey elixir that can help quiet coughs. I used it for myself the other night and my cold cleared right up and my cough calmed for the night! Little colds remedy is what got me interested in researching honey benifits. I get it for my 2 year old and have actually used it myself. My initial thoughts were “its just honey and water, how is this even bottled as medicine for kids?” Needless to say its worked on him and myself for coughs and sore throats and doing some research I see all the benifits honey has. Now I am stocked on raw honey and cinnamon. Natures sweets to a better health! I believe it’s the under one crowd who shouldn’t have honey. My daughter is feeling soo much better this morning when she woke up, dare I say 100% better? She has no fever, and is eating and happy! That’s great Joan! I posted this yesterday because my nearly 2-year-old woke up with just a little bit of a runny nose, so I had him dip his fruit in the honey/cinnamon mixture and his nose didn’t drip again the whole day. This morning he sounds congested, but he’s already had his honey/cinnamon mixture (from a spoon this time) and now he’s nursing. I’ll definitely have to try this. We put in a beehive last month, but don’t have any bees yet. Lucky for us, a neighbor across the street has several hives and he’s given us a bit of his raw honey. Wonderful stuff. I’m almost certain my mom is the one that passed this info along. Glad its helping everyone, certainly is nice and cheap!! This sounds much tastier than our usual, garlic :) However, if the cinnamon doesn’t seem to be doing the trick, freshly crushed garlic might take care of it. It’s a little harder to get into the kiddos so I’m going to make some garlic honey and see if they’ll take it that way. We use the garlic honey and it works real well. I usually make up some sage honey also. This yearI’m going to try the cinnamon honey. Both the sage and garlic honeys work real well. WOW!! I’m definitely going to keep this in mind for the future. Thanks! 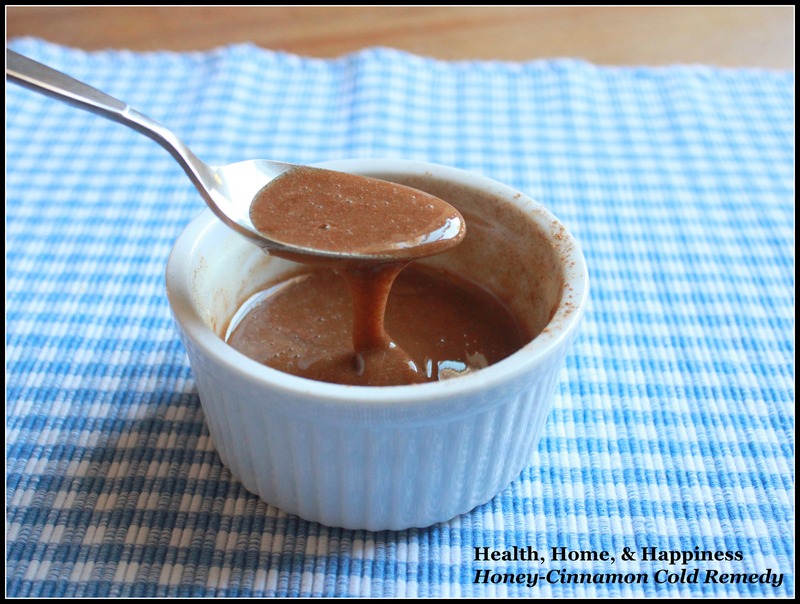 You can place 1/4 teaspoon cinnamon in baby’s applesauce or oatmeal to get them to ingest it when they are too young for the honey. Be careful not to overdo it with the cinnamon (all ages) as it can cause stomach upset ~moderation in all things. I would be more apt to take the honey and cinnamon cold ~mixed together on toast, or as I do, just down the hatch! Heating does destroy enzymes. It is good on fruits, but to make sure kids are getting what they need~ you might have them eat it on toast or take all at once for best results. Everyone is different and some viruses may not work with this remedy, but the majority of them will. The honey and cinnamon (one tsps honey with 1/4 tsp cinnamon)can be taken daily as it will not harm you and will help to ward off colds and other viruses. Make sure everyone is getting enough vitamin D as this is necessary. If you are diabetic and worried about taking honey daily, then the cinnamon on back of tongue washed down with some water will also do the trick most of the time. I do this when I am in a hurry; just don’t breathe in or you will seriously cough! So glad that this is helping so many people! I love to pass on these tried and true remedies! Can anyone point me to evidence regarding the supposed antiviral properties of *ingested* honey? I don’t have a link to any research, but I talked to a local beekeeper at the farmers market and he said that honey is antiviral and antibacterial (and antifungal) because it has a pH of 3.5 (highly acidic). That’s also why honey will never spoil. It has a shelf life of 3000 years or more. I found some cinnamon on Amazon that is cheaper, but was wondering if it would still work. It is called Frontier Natural Products Organic Cinnamon Vietnamese Premium Ground — 1 lb. It has 4.5 starts from 35 people. I just can’t see paying $25-$30….especially on something that I haven’t used before. The above is a tad under $13 and you get free shipping. You could also buy from http://www.mountainroseherbs.com It is $13.50 per pound and you can also get many other wonderful herbs and such from them. If you want to get this into your child and they are under 1 year old, then just add the 1/4 teaspoon cinnamon into baby’s applesauce or oatmeal. Too much of a good thing can turn bad. When we have a cold we take this remedy up to twice a day for 3 days to make sure it is gone(when it is a super bad cold). I have even been known to take just the cinnamon on the back of my tongue when I am in a hurry (don’t breathe in when you do this!!!!!) and it works fine. If pregnant, look into this before using. Though something is natural does not mean it cannot have contraindications with other medications or health issues. Always research what you are using so you know the safety and efficacy of the product you are using. We’ve all grown up ingesting cinnamon, but there can be circumstances when its use should be limited or discontinued. One thing I noticed for myself when using the Honey/Cinnamon as an apple dip, it felt like I had burned my mouth afterwords(it was a mild sensation. my daughter also complained of her throat hurting later in the day. I would just watch for the fact that cinnamon is spicy and I agree that this remedy is better used at the very earliest onset of illness and even before. I know as a child my sister was quite allergic to cinnamon. She eventually outgrew it, but her symptoms were a slight burning sensation in the mouth and throat, as well as a flushed look in her face. Perhaps its something to consult a doctor on before continuing use? Did she have a reaction to the cassia “cinnamon”. I know that a couple of years ago I started taking high dosages of cinnamon capsules and developed a flushed look to my face as well, so now I am very careful not to ingest too much of the fake cinnamon at once. thanks for the info. we are all sick at our house, despite trying to eat right and taking good supplements, including echinacea. i’m excited to try this on all of us, but certainly realize that it works better when you catch it at the first sign of sickness. can i mix up a weeks batch without it loosing it effectiveness, do you think? Susan, I think you could mix it all up at once without any trouble. I have to try this!! I want to make some of these home remedies before we get colds. You should look into buying local raw honey. I’m told it works wonderfully on seasonal allergies, but it must be local. Something about the bees picking up pollens of the things that actually cause the allergies helps build immunities. My husband takes his local honey in Elderberry tea. It seems to work decently well. we just tried it. I have a stomach ache now, but Im not sure if its the store bought hummus (we’ve been on full gaps for two months now) or the cinnamon. Ugh. Wishing I hadn’t tried either. However, my son, who is just starting a cold, also took the cinnamon and honey and he doesn’t have a stomach ache. So. Its probably the hummus. I must be allergic to one of the preservatives or something. If you had something with a preservative, then you are NOT on full GAPS. I started getting a cold on 3 days ago….I immediately started using 1 tsp of raw honey and 1/4 tsp organic cinnamon about 3 or 4 times a day…. Low and behold, my symptoms have not progressed. I feel a little sniffly and my throat seems to want to be sore, but it just isn’t happening. So if this is all I’m going to get, I’ll take it. I can function and I’m not all gross and sneezing everywhere…. I will continue to take the remedy until all my symptoms are gone. Thanks for the post….found you on Pinterest. This sounds like a great idea! We have tried so many natural remedies and our favorite has been the hydrogen peroxide in the ear (by cotton swab if they can or just a few drops in each ear) and gargling salt water. If you catch it right away it works! But I love having new ideas to try especially one that is so tasty! The other thing you can do with this is spread on a slice of toast (almond or coconut bread for GAPS). That’s pretty much our routine: got a cold? have some cinnamon toast! We have always used butter on the toast but coconut oil might give a better therapeutic effect. It might also help those who feel it’s too spicy or upsetting to the tummy. I would caution against putting it into tea though, if you want the benefits of raw honey. Can i use just regular honey that comes in the little bear? Most store bought “honey” has a high fructose corn syrup content. Be sure to read the labels and look for raw, organic, unfiltered honey, best if locally grown but if not, stick to the ingredients I just listed. I do this often, but I recently wondered if the cassia sold as cinnamon works as well. I’m not quite sure what I’ve been using. Hi there! I found this post through Pinterest! Just wanted you to know that I mentioned it in a post on my blog, Mindful Momma! I hope you don’t mind that I used the photo – I credited you of course! Hope you have a green & healthy weekend! Thanks so much for sharing this! I”ve never tried this before, but my throat is getting scratchier as the day goes on and I can feel the sniffles coming on – I’m mixing up a batch of this as soon as I get home to try! I’ll let you know how it works! My mom has had the worst cold and nothing was making her feel better. I found this linked on Pinterest so told her to give it a try. All natural, so it can’t hurt, right?! She started coughing up stuff and her nose was running like crazy the next day. She’s feeling 100% better and is calling all her friends to tell them! Thanks so much for sharing! Please be careful about assuming that “all natural” means it can’t hurt. Mercury and lead, for example, are natural, but highly toxic. And many, many plants and fungi are poisonous. To think that “natural” means “harmless” can be a deadly mistake! I’m sure that the organic honey is the best, but I like many others am on a budget and have to use what I have. I used the honey that comes in the bear bottle and it worked well. Well you know what they say–treat a cold and it’ll be gone in seven days. Do nothing, and it’ll be out in a week! But hey, it sounds like it would be yummy on toast! A couple of weeks ago, I came across this on another pin. This was right around the time I had a sore throat/cold brewing. My experience: 2 days of sore throat in the a.m. 3rd day started the honey/cinn took 4xs.. that night woke up with so much pressure in my head/sinus my teeth felt like they were going to pop out of my head….So I made green tea with the honey/cinn mixture, saturated a paper towel with lime juice on my forehead(from another pin for headaches), found chicken broth in cupboard heated a mugful up, took 2 aspirins ,drank tea & chicken broth and went back to bed. The next morning woke up and all I had was a sniffle the pressure was completely gone. I continued with the green tea honey/cinnamon the 4th day…Then the 5th day in the morning I drank the tea combo…and I got sick in the stomach and threw up…I think I was overdoing it so I stopped taking the honey/cinn combo… I didn’t take any cold meds except the aspirin the 1x..So I believe it truly did help me…Just don’t overdo it! And if you give it to kids just give 1tsp of the mixture I gave it to my 4 year old granddaughter she liked it and it helped her. @Chris MacDonald – sorry, I can’t ‘prove’ anything, but I was in the middle of a really bad cold and had been dosing myself up with Vitamin C which didn’t help. Then I found this Honey-and-Cinnamon remedy. I mixed some up last night, took it and went to sleep (huh? I hadn’t been able to sleep for a blocked nose for 2 nights!). This morning I woke up without a sign of a cold at all! Since I wasn’t doing anything else, apart from the Vit. C, I feel I can safely say that it really did it for me. I was right in the middle of this cold which was still getting worse, and it’s completely gone, so yes… That does it for me! does this only work at the first signs of a cold or will it still help if you have had a cold for a few days? I’ve noticed that everyone is replying regarding its wonders with respect to colds. I get frequent UTI’s and I noticed there was something mentioned about it helping that, too. Has anyone experienced any luck with this? I have tried the cranberry pills, etc., but it just doesn’t do the trick and I’m tired of going to the doctor every time I get a UTI and end up on Cipro. Just wondered if anyone has tried it for that yet. I’m certainly going to!! I’ve never tried this remedy, but I used to get frequent, intense UTIs that always ended up requiring antibiotics, no matter what else I tried. What finally worked for me was d-mannose, which is a sugar that is not metabolized by our bodies — however, the bacteria just love it, so they attach to it and are flushed out of your system with no side effects. I honestly have never tried d-mannose by itself, but have used it in a formula called UT Vibrance, which has other herbs that support urinary tract health. It’s kind of spendy ($35 for a jar that you take for a few days until the jar is done (by which time the infection will have been cleared)), but worth its weight in gold for me. I’ve found it clears the painful symptoms as quickly as antibiotics. Like I said, since I’ve only used the UT Vibrance, I can’t tell you how well d-mannose works on its own, but I know that’s the ingredient UT Vibrance is based on. You shouldn’t pour the mixture into hot tea. It’s like pasteurizing. The heat destroys the enzymes. That’s why you used raw honey to begin with. Thank you so much for this remedy!! I have suffered from colds, lung infections and chest congestion for all the 20 years of my life!! My granny gave me honey and basil sometimes but I always had to rely on heavy antibiotics! Recently, I’m away from home and had a cold that wouldn’t go away! :( I bought honey but I decided to find out how to actually have it! I found your site and gave it a try! I didn’t have cinnamon powder, so I took a few bits of cinnamon, a thin slice of ginger, a tablespoon of honey and gulped it down with water! It was a miracle!! I started feeling better instantaneously and all that yellow goop (I know it’s gross) started thinning down!! I’m so happy I’m finally recovering!! Hi..you can buy cinnamon pills now in Walmart in Canada if that helps anyone as I have read the benefits of honey and cinnamon and joint pain etc..as well as many other ailments. It is truly a natural remedy for pain relief. My daughter came down with a summer cold the day before she starts first grade!! Shes eating this now in some applesauce! crossing my fingers we can turn her around quick!! My son has had a cold (sniffles, coughing, etc) for the past day or two and now it seems that I am catching what he has. Tomorrow starts the second week of school, so I am hoping the cinnamon/honey mixture helps a lot!! I’ve been using honey and lemon for colds for years, never tried the cinnamon so I’ll have to give that a try. My dad always mixed in a dash of bourbon with it…. don’t reccomend it for kids but it sure helps me when I have a cold. I discovered that honey actually works on at least a sore throat when i ordered tea with honey and lemon at a restaurant and the server put wayyy too much honey in the tea for my taste. But I was sooo grateful when I started feeling better, my throat immediately,then I noticed the cold kinda stopped in it’s tracks. after that I increased the honey in tea whenever I coming down with a bug, or maybe just over worked an run down. I love the idea of adding cinnamin to the honey, I was using Lemon. I will def try this next time!! Thanks! do you know if the honey in the little bear container is pure honey? thanks for anyone help in advance! It likely isn’t. Look for raw honey, which you can find at places like Whole Foods or other natural food stores. I found and pinned this on Pinterest MONTHS ago, and a few days ago, I had the chance to try it out. First off, it immediately soothed my throat. When I get a cold, the back of my nose/throat hurts, which makes my gag reflex hyper-sensitive, to the point where just talking above a whisper makes me gag. This took care of that immediately. I took it every few hours for the next 2 days, and I’m feeling so much better. Still have a cough and am slightly congested, but I don’t have that “Oh God, I feel like I’m dying!” feeling. I used to swear by Zicam, which always gave me great results. However, the high dose of zinc always made me really nauseated. This however, does not make me sick, and gives me the same results as Zicam. I’ve used cinnamon and honey in various ways in my diet. I did read some comments about now giving honey to young children. I’m in my 80’s, and I grew up on honey, from birth till now, and I have not suffered from it. And it was the legendary Dr. Hugh McGavin who recommended to my mother to sweeten her baby’s foods with honey. So both my brothers and I have been raised on natural, raw honey. I like this website! The problem with honey under 1 is the increased risk of botulism. DONE! I’m printing this recipe as we speak! I’ve been looking for a remedy for my sons cold that works and by the comments it looks like this one does. Thanks! Great idea. I saw this on facebook and tried it after getting caught out in the rain recently. Think this is a better consistency with a teaspoon of natural yogurt added. I used Manuka honey as well. Does really seem to settle a scratchy throat. It’s worth getting proper Ceylon cinnamon too over the cheaper stuff. I followed your link to buy raw honey online (it was even on sale) & I have received it. Never had anything but the honey they sell in the grocery stores. This honey is solid. I’ve read that you shouldn’t microwave it to soften it because that will kill the goodness of the honey. Instead you should set the jar in warm water to soften. Have you run into this, the honey being solid?? Is that normal?? Thank you so much for posting this! I found it a couple of days ago on Pinterest. I was heading for a good, old-fashioned cold with all the runnings and coughings and sneezings that go with it, and I was dosing myself up with Vitamin C as I was taught as a child. It didn’t help! So I decided to give this a try. I mixed up 4 teaspoons of organic honey with 1 teaspoon of – ordinary – Cinnamon and took about half of it before going to bed. This morning my nose was clear, my throat felt fine and I’ve not had a sneeze or cough or anything else associated with a bad cold since! It worked even faster and better than I had thought it would from earlier posts. Thank you so much for this miraculous remedy! And it couldn’t taste nicer too! What kind of cinnamon do you use? I have raw honey and organic cinnamon. I dont think the organic cinnamon is toxic? My 13 year old son got a severe sore throat and chest congestion. I gave him the honey and cinnamon and he felt better the next day. 2 dayslater he was 100%. A day after he got it I started to get the sniffles and did the same thing. Within a few hours the symptoms were gone. Now my wife came home with a sore throat. We’ll see how much better she feels in the morning. Do you take the whole thing you make? We can get local honey here but I choose not to buy it because it’s made from GMO canola. I took the kids to a tour of the plant where they process it and they talked about how they take there bees to canola fields all over, they take them other places too. Then I read that honey solidifies differently depending where the honey comes from and that honey from canola solidifies easier and the local raw honey is always completely solid. So I order raw honey from wild flowers, its delicious! I want to support local farmers more but most of them support monsanto, I want nothing to do with that! Hello, I was reading through this page and noticed that this entry is tagged under babies, this should NEVER be given to babies. Children under a year old can die from ingesting honey due to the raw nature, it carries Clostridium botulinum which as adults and older children we fight, but as babies they can not handle, so please never give honey to a child under a year old. You can buy Ceylon cinnamon at Penzey’s, in stores or online. Hope that helps! I take honey and cinnamon two times a day regularly and I still have a cold eight days on! Where am I going wrong? Well I. Have a sinus infection and I just took some honey & cinnamon & and breath partly through my nose again its most definitely working. I’ve given this to my granddaughters (ages 3-7) but gave them a slice of apple to dip in and they scarf it down!! Fevers don’t stand a chance!!! I’m having to be an adult today, sister is sick, taking care of her, taking care of her kids, hopefully this will help my sister! thanks! does it matter if its ground cinnamon? I have been using this all winter and it works! Hey all, I just found this website about an hour ago and made up a mixture. I’m breathing and feeling better already… Will use this remedy for every cold and save a ton of money as well. Thanks so much for this information. Can you use ground cinnamon? Agarwood tea is rich in flavonoids which helps your body eliminate fat. And an even better recipe is 1 glass of warm water, a tablespoon of honey and two teaspoons of Braggs Organic Apple Cider Vinegar (ACV). Usually the ACV alone is fine, but kids will never touch ACV so it’s best to mix all of them. I know I have been taking ACV within minutes of feeling sick and I have not been sick in years, touch wood. But you must take it at the first sign of a cold or sore throat or itchy watery eyes; otherwise this concoction is not strong enough. So don’t let it linger, especially in children. Give it to them fast. I found this remedy online and started taking cinnamon and honey within 12-18 hours of first feeling sick. Usually with a cold I would be knocked out for the first few days with a headache, fever and general unwell feeling. This time I’m surprised that my nose is only a little sniffly and my sore throat has gone. Im going to continue to take it until the symptoms have gone but i swear by this now! Certainly beats all of those cold and flu tablets out there! :) Thanks! Cara, can you add the info about not giving honey to babies to the original post, in case some moms don’t read the comments? Thanks for the tip. It would be even better to be specific – GROUND cinnamon mix with raw honey. 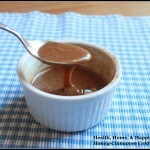 Thanks for finally talking about >Honey and Cinnamon~ A Simple Cold Home Remedy that Kids Love! | Health, Home, & Happiness ™ <Loved it! I made some of this for my 3 year ola who is coming down with a cold. I followed the measurements but it was not liquid enough to give to him and I had to add about a tablespoon of honey instead of a teaspoon. Is this measurement accurate– can’t figure out why it didn’t work. Want to make sure I’m not messing up the ratios. Thanks. I’m am trying to find the cinnamon and honey receipe for arthritis is it the same as the cough one? I’m trying cinnamon, honey, and apple cider vinegar for my sore throat. hope it works.! this technique is awesome . my younger brother get completely out of cold with in one and half days…. Wonderful article. I’ve recently become enthusiastic about alternative medicine/home treatments soon after being misdiagnosed by my GP for a potentially life-threatening situation. I feel more and mor folks are starting to wake up and recognize that the healthcare establishment does not have our best interests at heart, and they have to take responsibility for their own overall health, simply because nobody else is going to. Regrettably, mainstream media continues to label anybody who talks about all-natural therapy/alternative medicine as a “quack” or even a “charlatan” like this article from NBC news: http://www.nbcnews.club/cancer-patients-turning-alternative-remedies/260 . It’s nothing more than a hit-piece. We need some honest reporting concerning the success rate of alternative medicine, it is about time. Can you use Cinnamon essential oil instead of ground cinnamon? No, I wouldn’t do that, I don’t know how much you’d need to dilute it but it would be a lot. Adding honey to a hot drink defeats the purpose of using raw honey. According to Ayurveda, raw honey rids the body of toxins while heated honey is itself a toxin. So is it ok or not to use regular ground cinnamon from grocery store b/c I’ve already given one dose to my daughter with the regular cinnamon. So using regular ground cinnamon can be ok? As long as you don’t give the cinnamon to them straight? B/c I used the regular cinnamon and when I combined with the honey it dissolved it some and seemed to help. I just looked at the Chinese herbal treatment you suggested and it has a warning on it that says it contains lead! What’s that about? It’s just because of a regulation in California, plants and herbs naturally contain trace amounts of lead, and that puts them over the california limit for supplements. You can look at the brand’s website for more info. oooh! Thanks for the tips and recipes! My fix when I have a cold is Herbal Lemon tea seeped along with a cinnamon stick and chicken noodle soup. This is the best recipe for weight loss, Honey and cinnamon!